Held within the confines of Bhutan’s largest district in Trashigang Dzong (Fortress), the three day tsechu is observed during the 7th to 11th days of the tenth month of the Bhutanese calendar (December). The unfurling of the Thongdrol of Neten Chudrug (Sixteen Arhats) on the 10th day is one of the highlights of the festival. The Thongdrol of Guru Tshengyed is also displayed on the last day. Hundreds of people from the neighboring districts of Trashiyangtse, Mongaar and nomads from Merak and Sakteng join in the festive. For this tsechu, you have the choice to either enter from Paro and exit from Guwahati or do the opposite. 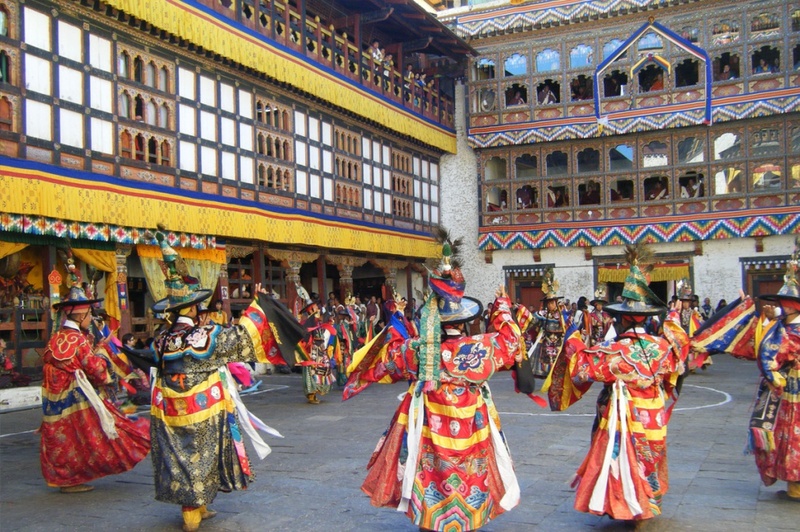 Visit Dzong and witness Trashigang festival. Held within the confines of Bhutan’s largest district in Trashigang Dzong (Fortress), the three day tsechu is observed during the 7th to 11th days of the tenth month of the Bhutanese calendar (December). Hundreds of people from the neighboring districts of Trashiyangtse, and Mongaar join in the festive. Day 05. Tashigang – Tashiyangtse – Tashigang: Early in the morning drive to Tashiyangtse and on the way visit Gom Kora temple and continue the drive to Yangtse. The main attractions in this valley, is a great stupa, Chorten Kora built in 1940 modelled on the style of the Boudhnath stupa in Nepal. After lunch visit Trashiyangtse town, small but beautiful with traditional designs and colors of the houses. It is also famous for wooden products like dapa (wooden plate), phob (cup) and others. One of the traditional painting schools is located in Tashiyangtse. Drive back to Tashigang. Overnight at hotel. Day 07: Mongar – Lhuentshi-Mongar: After early breakfast drive to Lhuntse, one of the most rural and isolated districts in Bhutan. The landscape is spectacular with stark cliffs and gorges, beautiful conifer and pine forests, and remote villages. The Kurtoe region of Lhuntse is the ancestral home of Bhutan’s Royal family. And also consider being the best for Kishu Thara textiles. Visit Lhuntse Dzong and the weaving centres. Drive back to Monger. Day 08. Mongar – Bumthang: After breakfast drive to Bumthang and you would notice a change in the weather condition as it becomes colder. We will stop at Sengor and few other places. Upon arrival at Bumthang, we can visit the town and meet the people. After breakfast we drive to Phobjikha. En-route, we will stop to visit Trongsa Dzong – seat of the district administration, built in the 1648, including the Tower of Trongsa, which has been converted into a museum from a watchtower. Continue driving to Phobjikha. Day 11. Phobjikha – Punakha: After breakfast drive to Punakha. On the way visit Chhimi Lhakhang – which was founded in the 15th century by Lama Dukpa Kinley also known as the divine mad man. After lunch visit Punakha Dzong- built in 1637 by Zhabdrung. It is one of the most beautiful Dzongs in the country. Later walk around Punakha and Khuruthang town. Day 12. Punakha -Thimphu: The three to four-hour drive traverses thorough a constantly changing kaleidoscope of vegetation, waterfalls, flowers, mountains and meadows. In about 45 minutes we will reach the famous Dochula pass (3,100m) where on a clear day we can see the entire eastern Himalayan range, teeming with 6,000m to 7,554m snow-capped mountains. The pass also known for its abundant species of extremely beautiful flowers has 108 Buddhist stupas exquisitely built around a mound, adding to the natural splendour of the place. Day 16: Departure from Paro: After breakfast, you will be driven to Paro international airport for your onward flight. Our representative will see you off.